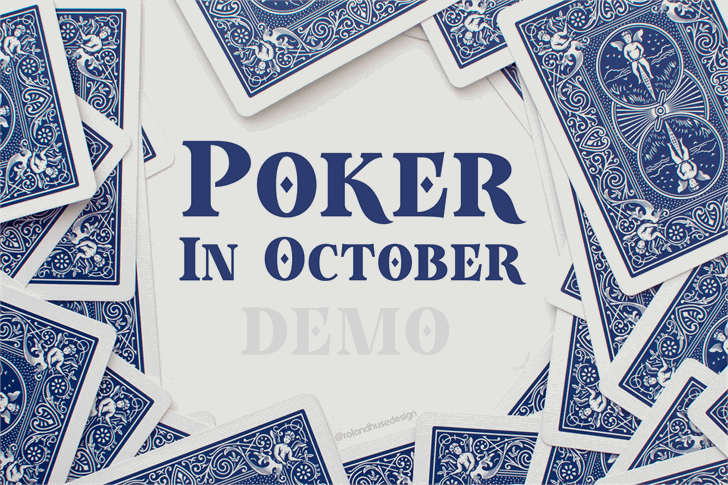 POKER IN OCTOBER is a layered All Caps color font. Please note that this is primarily for headlines, logos posters in large size so there are no characters included that might be required in a body copy. This is a DEMO version of the Main font instance without the 3 other layers. The SVG font comes in the original color palette that you can change layers separately as you like in the otf font file that is a different font file and you need to install them both in case you like the default color font and the separate layers. sell these fonts or claim them as your own. edit or rename these fonts. Thank you and hope you like this font! Copyright © 2018 by Roland Hüse. All rights reserved.